The current time period is perhaps most strongly colored by the ongoing square of Uranus and Pluto, and Saturn's entrance into Sagittarius. This is having profound effects in many areas of life including spirituality and belief systems, politics, and economics. We are offered endless opportunities for growth and transformation, allowing past doubt, fear, and limitation to be dissolved away. Saturn is most strongly associated with Capricorn, the sign being traversed by Pluto for the next decade or so. The experience is that of climbing to the mountaintop of spiritual aspiration, there to hopefully be illuminated and transfigured. The task is to then go back down to the world and share openly and freely with all one meets. Through the trials and tribulations of our terrestrial existence we come to terms with fear and limitation. We learn lessons of patience, perseverance, timing, and humility, and begin to make slow but steady progress along the spiritual path. We fulfill our karma by going through it, by accepting the many transformational opportunities that come our way. The pain of new birth releases past suffering, expands awareness, and allows the flame of indwelling Spirit to burn ever-brighter. The process of spiritual unfoldment is often trying and difficult, testing personal resolve and will. Yet we are given many tools to assist us such as intelligence, intuitive knowing, faith, resilience, meditation and contemplation, relationships, astrology, and crystals. Each has an important part to play in the drama of awakening, and certain tools speak more strongly to some than others. Crystals are particularly wonderful, having uses and qualities that encompass a broad range of growth-oriented activities. The crystal kingdom, astrologically speaking, comes under the aegis of Saturn, and is linked with Pluto as well. It is the energies and lessons of these two planets that primarily govern one's spiritual unfoldment. As we learn to overcome our fears and limitations through confrontations with the Shadow, we emerge from the tunnel of ignorance and short-sightedness into an arena filled with wider perspectives and awareness. The Light pierces the veil, and truth is revealed. Crystals are pure light coalesced into form through the actions of heat and pressure. What an exquisite image of the spiritual journey! With their helical matrix and myriad forms, ability to replicate themselves, store knowledge and information, balance and harmonize forces and radiate them forth, they are wonderful mirrors for the human experience. And at this time of great crisis and change they are able to act as transmitters of new levels of understanding and knowledge that can help us, individually and collectively, to heal ourselves and our planet. In my own work with crystals, I have been able to tap into rich and multi-layered dimensions. Information about aspects of the Ageless Wisdom and Mystery Tradition, healing arts, ancient civilizations, and the supersensible realms has sought emergence. The process of transformation subtly taking place through these contacts has led to enormous growth. I have noticed that locating crystals in various places in my home has assisted with cleansing and charging the energy field, diminishing negative and disharmonious elements and replacing them with feelings of joy and upliftment. Using them in meditation and with clients, my sensitivity to their energies and qualities has gradually increased. The steady effects upon my consciousness and ability to manifest Spirit in daily life have been wonderful and fulfilling. Interestingly, as the crystals closest to the surface have been mined and operations take place at deeper levels, new varieties have been appearing. 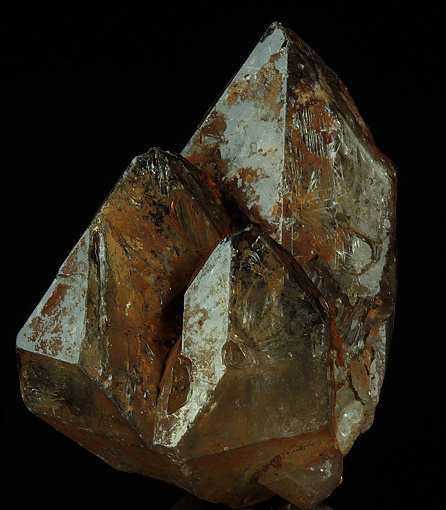 Perhaps the most important of these discoveries are elestial crystals, or skeletal quartz. Found mainly in Brazil, mostly smoky in color, and double-terminated, they are unique in having labyrinthine and sometimes water-filled chambers, and mysterious etching. They are incredibly powerful, and have the ability to transport one into the depths of beingness and the Earth, and then gently outwards toward the farthest reaches of the cosmos. They are a wonderful way of attuning one's vibrations more fully to the levels of consciousness seeking emergence at this time. But the most important aspect of working with crystals is one's own experience. Only through personal contact, over a period of time, can the fullness of this realm and the changes in awareness and ways of being become apparent. Each of us is charged with the responsibility of creating a strong container for the outpouring of universal forces. As we drink deeply, allowing the qualities of forgiveness and compassion to surround our innermost being, the veils of illusion and self-deception lift, and the clarity of the Light shines forth. We emerge anew into the marketplace of everyday affairs, ready to serve our fellow beings in truth and oneness.